Comment: The photo above is so you can see what the page layout looks like in my copy-text. The lower half of each page is a (quite enjoyable) word-for-word rendition of the tale translated more smoothly in the upper half. The book was intended, after all, for specialists interested in the Koryak language, an sich. My sense from the introduction is that the linguists and ethnographers involved in the research expedition cared nothing for the actual content of the stories they collected. 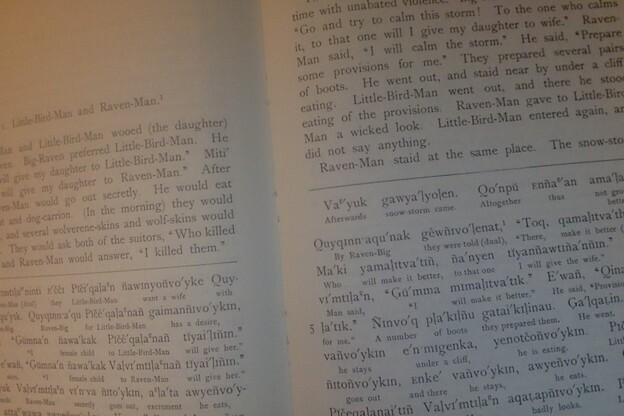 They just wanted to set native speakers talking, so that the Koryaks’ homemade, inconsistent, Martian grammar and diction could be recorded and analyzed. The introduction, meanwhile, does not explain why all but one of the expedition's informants were female. The two narratives below issued from the mouth of a "Koryak girl of the village of Kamenskoye." Her name was Pa’qa. Having read this book three times over, with increasingly heightened attention each time, I judge Pa’qa to be the best of the storytellers included. Easily. Anyhow, she always enchains my attention by delivering what you get from the most twisted of the Grimms’ stories. Situations where either the morality is bizarre—or the structure. I also love that thing (you get this from Russian folktales too) where, at the end of the story, you go: "What the hell kind of story is that?" Then a snow-storm broke out, and continued for a long time with unabated violence. Big-Raven said to the suitors, “Go and try to calm this storm! To the one who calms it, to that one will I give my daughter to wife.” Raven-Man said, “I will calm the storm.” He said, “Prepare some provisions for me.” They prepared several pairs of boots. He went out, and staid near by under a cliff, eating. Little-Bird-Man went out, and there he stood eating of the provisions. Raven-Man gave to Little-Bird-Man a wicked look. Little-Bird-Man entered again, and did not say anything. Raven-Man staid at the same place. The snow-storm continued with the same vigor, without abating. Oh, at last Raven-Man entered. His boots were all covered with ice, for he would make water in his boots. That is the reason why the boots had ice. He said, “It is impossible! there is a crack in the heavens.” After a while they said to Little-Bird-Man, “Now, then, calm this storm!” He said, “It is impossible. Shall I also go out and make water in my boots, like Raven-Man?” Then Big-Raven said to both suitors, “Go away! None of you shall marry here.” Then Little-Bird-Man said, “All right! I will try.” He took a round stopper, a shovel, and some fat, and went up to heaven. He flew up, and came to the crack in the heavens. He stopped it with a stopper, and threw the fat on the heavens all around it. For a while it grew calmer. He came home, and the snow-storm broke out again. Even the stopper was thrust back into the house. It was too small. He said, “It is impossible. The heavens have a crack.” Big-Raven made another stopper, a larger one, and gave it to Little-Bird-Man. He also gave him a larger piece of fat. Little-Bird-Man flew up to the same place and put this stopper into the crack. It fitted well. He drove it in with a mallet. He spread the fat around over the heavens, shovelled the snow around the hole, and covered it. Then it grew quite calm. He came back, and then Raven-Man grew hateful to all of them. He took a place close to Miti’; and she said to him, “How is it that you smell of excrement?”—“Why! it is because I have had no bread for a long time.” She said to him, “Enough, go away! You have done nothing to quiet this storm.” He went away. Little-Bird-Man married Yini’a-ña’wg̣ut. Summer came. It was raining hard. Then Raven-Man put the sun in his mouth; so it grew quite dark. After that, they said to Čan·ai’, “Čan·ai’, go and fetch water!”—“How shall I fetch water? (It is too dark).” After a while they said to her, “Why, we are quite thirsty. We are going to die.” She went groping in the dark, then she stopped and began to sing. She sang, “Both small rivers are stingy (with their water).” Then a small river came to that place, bubbling. She filled her pail bought from the Russians (i.e., an iron pail), and carried it on her back. (Suddenly) a man came to her. She could not carry the pail. He said, “I will carry the pail (for you).” She came home in the dark. The man followed. It was River-Man. They said to her, “Who is this man?” He said, “I am River-Man. I took pity on that singer.” They scolded their daughter. Nevertheless River-Man married her. After that they remained still in complete darkness. They said to River-Man, “Why are we living in darkness?” He said, “Why, indeed?” He put on a head-band of ringed-seal thong. He went out (and practiced magic). Then at least a little light appeared. The day dawned. They spoke among themselves, “How shall we do it?” Then Yini’a-ña’wg̣ut prepared for a journey. She went to Raven-Man and asked, “Halloo! Is Raven-Man at home?” Raven-Woman said, “He is.” She said to Raven-Man, “Since you went away, I have been feeling dull all the time.” She found Raven-Man, and said to him, “Did not you feel dull (since that time)? Will you stay so?” He turned his back to her, but she wanted to turn him (so that he should look with) his face to her. But he turned his back to her. Then she tickled him under the arms. She put her hands under his armpits. His sister said to him, “What is the matter with you? Stop it! This is a good girl.” After that he began to make sounds in her direction, “G̣m, g̣m, g̣m!” She turned him around, and at last he laughed out, “Ha, ha, ha!” The sun jumped out and fastened itself to the sky. It grew daylight. After that they slept together. She said to him, “Have you a tent?”—“No!”—“Have you a fork?”—“No!”—“Have you a plate?”—“No!” She said, ”Then let us go home! I have all those things at home.” They moved on to Big-Raven’s house. She said to Raven-Man, “Oh, you are a good man!” and he felt flattered. Afterwards she killed him. She came home. And they said to her, “What have you been doing?” She said, “I killed Raven-Man. He had the sun in his mouth.” From that time on it was quite calm. Raven-Woman said, “Well, now, does my brother remember me? (Probably) he has plenty to eat.” She said, “Let me visit him.” She visited him, and he was dead. Then she cried (and said), “He caused annoyance to other people. (Therefore he is dead. )” She left him there. There was nothing else to do. A house was there, also reindeer (for driving). He said to her, “Let us go to Big-Raven! Now let them say again that you have a bad husband!” They went with a caravan of pack-sledges, and they arrived. The people said to Big-Raven, “Oh, your daughter has come with a caravan.” Big-Raven said, “Our daughter went away on foot.” She said, “Here I am, I have been brought home by Little-Bird-Man.” Little-Bird-Man made numerous driving sledges, all of silver. They lived there all together, and travelled about in all directions with a caravan of pack-sledges. They lived in joy. They staid there. After a while she turned to them again, and began as before, “What is it that I have found? Oh, indeed it has nails! Oh, indeed, it has eyes! Oh, indeed, it has whiskers!”—“Go to her and see what she has found!” They came to her, and really it was a small ringed seal. They said, “Let us go home!” They went home and told their mother, “See, mamma! we have found a small ringed seal, but grandfather took it away.”—“Did he? Then we will fetch it back. O daughters! go and look into his house.” They looked in. Then they came back and said, “Eme’mqut is skinning it.”—“Now you there, [you Mouse-Girl,] go and look in!” She looked in. “Just now they are cooking it.”—“Now you there, this one, go and look in there!” She looked in. “Just now they are taking the meat out of the kettle.” Mouse-Woman said, “Oh, I wish Big-Raven would say, ‘We will eat it tomorrow!’ We must find a shaman’s small stick (used in magic). Oh, you there, small Mouse-Girl! take this bundle of grass (on which magic has been practiced) and carry it to Big-Raven’s house. There drop it through the vent-hole. They (the Mice) took it and carried it there, and dropped it into the house. Big-Raven immediately said, “Miti’, we had better eat this meat to-morrow.” And she said, “All right!”—“Oh, you, small Mouse-Girl! go and look into the house!”—“Just now Miti’ is arranging the bed.”—“And now you, go and have a look!”—“Just now they have gone to sleep, they are snoring.”—“Now, there, let us go!” They took bags and iron pails, went there, and put all the cooked meat into them, also what was left of the broth. They defecated (into the kettle), also filled Miti’’s and Big-Raven’s boots with small pebbles. He slept, and they painted his face with charcoal. “O grandfather! get up, the day is breaking!”—“Yes, all right! I will get up.” He awoke. “Grandfather, have a drink from the river there!”—“All right! I will drink!” He went away, and came to the river. He began to drink, and there he saw in the water his own image. “Halloo, Painted-Woman! you there? I will drop a stone hammer as a present for you.” So he dropped it. “Halloo, Painted-Woman! I will drop down my own body! Halloo, Painted-Woman! shall I marry you?” Oh, he jumped down into the water. That is all.